After a week in Thailand, we flew from Bangkok to Singapore and spent 4 days here to finish off our holiday. Having read about, as well as watched photos and tv-programs about Marina Bay Sands, we had decided to stay there long before we booked the holiday. I only have one word for this stunning hotel; F A S C I N A T I N G ! The hotel (http://www.marinabaysands.com)is huge, divided into 3 towers, each consisting of 57 floors and a giant, 340 metro long Sky Park on top of it all…. The Sky Park is very famous for it’s 150 metres long swimming pool – currently the largest and highest located infinity pool in the world. There are also plenty of restaurants on top, jacuzzis with gorgeous views as well as several view points. 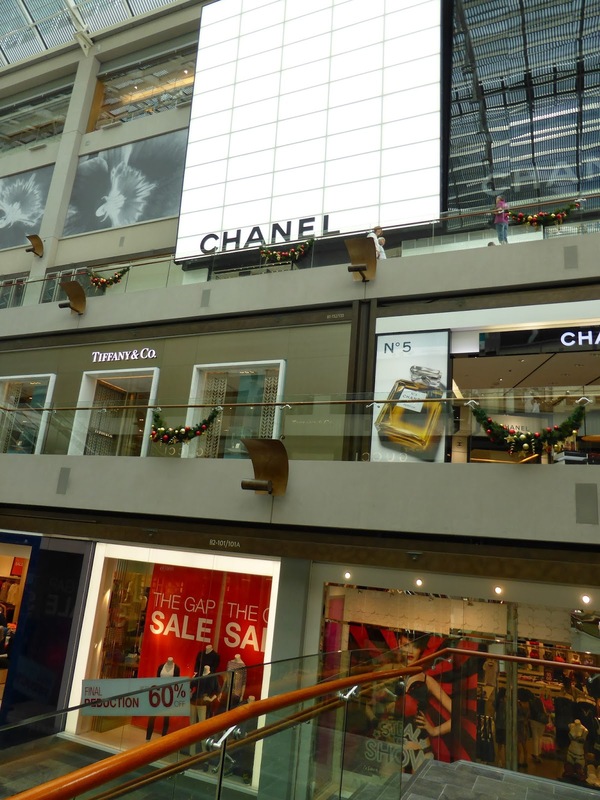 It’s like a small town of it’s own with hotel, offices, restaurants, shops, cafés as well as a huge shopping mall across the street, The Shoppes at Marina Bay – a mall so huge I gave up to see all the shops after not even finished one floor…. The mall also has a casino, ice-skating rink, convention centre, theatres, expo, channels with gondolas and so on….and so on…..and…. There was also a surprise Anniversary cake in the room in the evening with a personal welcome from the Service management team – a very kind gesture! Our room was huge, 39 square metres…. Due to tourist tummys the last days, we ended up spending a bit of time in our room and the Service management team was very helpful the last day and gave us a special rate for a dayroom the last day. Twice every evening, there was an impressive sound and light laser show right outside our window. We had an excellent view of it and despite having taken below pics through a closed window at night, from 45th. floor…. am quite pleased with the results. 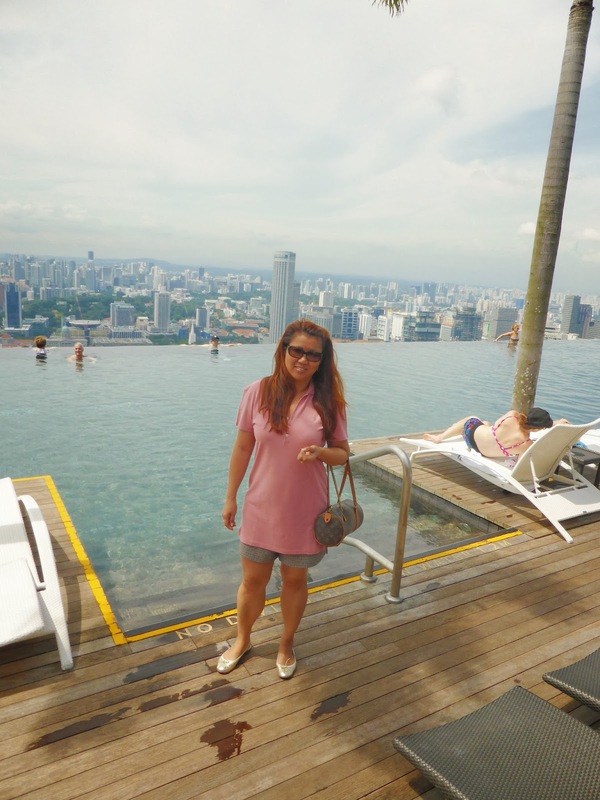 I spent several hours in the water just enjoying that spectacular view over Singapore city centre…. The whole pool area and surroundings are so inviting and the staff, like anywhere else in the hotel, are extremely friendly and very service minded at all times. We have about 150 pics from the pool area….. Must be the most photographed pool ever! Food at Marina Bay Sands was also good. The first evening we had dinner up on the 57th. floor by the pool. Our stay had breakfast included, however, due to illness, we only managed to eat here once. It was such a shame as this was the most extensive and various breakfast buffet I’ve ever experienced. All looked very tasty, fresh and yummyyyy….and sooooo much to choose between…. !